With the holidays approaching, TriMet will adjust bus routes that normally travel through the Clackamas Town Center. On busy shopping days, including Black Friday, ten bus lines will detour from their regular routes through the mall parking lot. This is the fourth year we have adjusted bus routes to reduce traffic while allowing buses to stay on schedule. New this year, the buses will go a short distance into the lot, entering at SE 85th to serve the Clackamas Town Center Mall stop (ID 12922) and a temporary stop on Driveway #3, which runs between the movie theater and Monterey Avenue, before traveling to SE Fuller Road MAX Station. 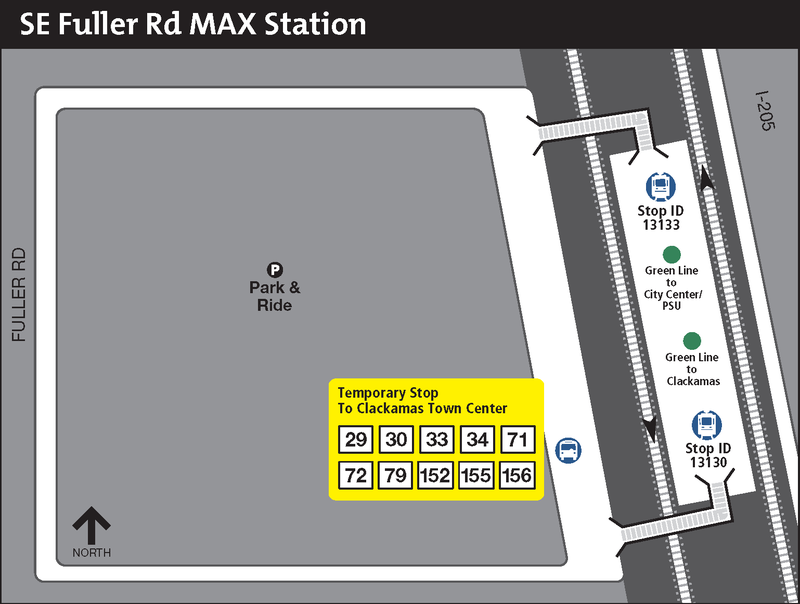 Stay onboard your regular bus and continue to SE Fuller Road MAX Station. 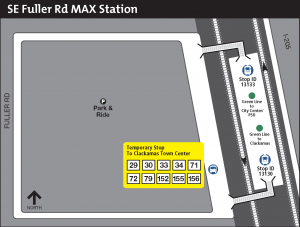 Board bus at temporary stop on Driveway #3 and transfer at SE Fuller Road MAX Station, about a five-minute ride from Clackamas Town Center. 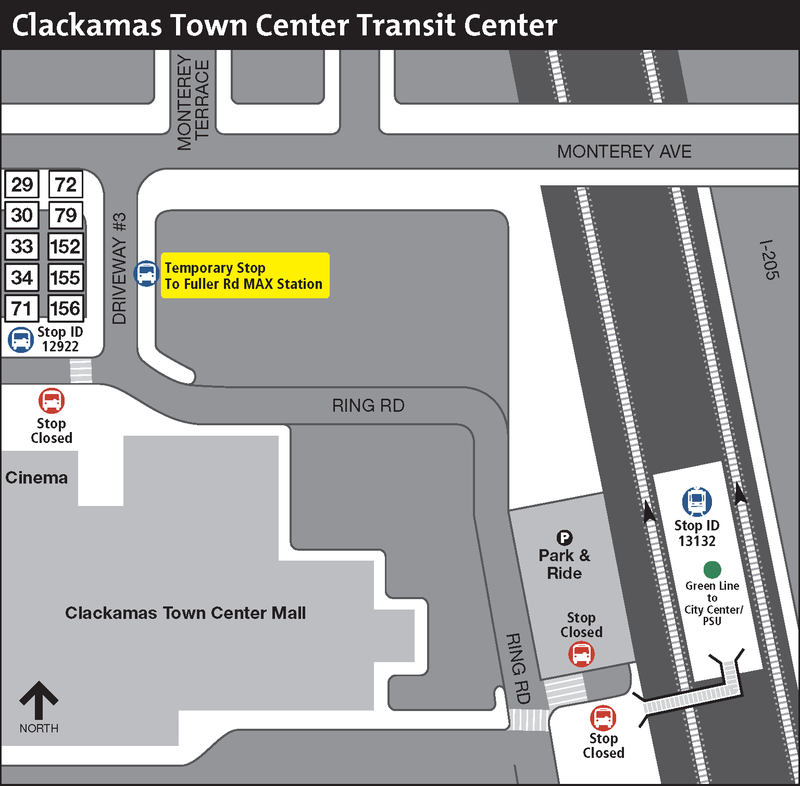 Get off at Clackamas Town Center Mall stop and proceed about a ½ mile to Clackamas Town Center TC MAX Station, which remains open. 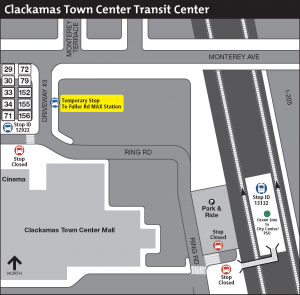 Proceed about a ½ mile from Clackamas Town Center TC MAX Station to regular Clackamas Town Center Mall (Stop ID 12922) stop. Get off MAX at SE Fuller Road MAX Station and board bus at temporary stop in the parking lot. Riders on the affected bus lines should plan an extra 15 minutes to trips and dress appropriately for the weather as the temporary stops do not have shelters. Also avoid bringing large strollers. On buses, all strollers will need to be folded for safety.